Today was another long day. I took a little longer getting ready, so everyone else had left by the time I got ready. I grabbed some breakfast at the Albergue before hitting the trail. I finally set off around 8:00. About an hour later, I came across the other three packing up at the bar about to hit the trail again. I was greeted with a big wave and a loud collective hello before all three ran up and greeted me with hugs. I was so touched when my Italian friend greeted me with a hug and said “little brother” in his Italian accent. It really is my Camino family. We haven’t really planned on walking together, but every day it ends up that way. It made my heart really happy! Early in the day, it was almost constantly down hill, which can be rather tough on both the knees and feet. We continued on the way came to one of the option points. We could go the short way or by the Hermitage, which is 5 kilometers longer. For some unknown reason, we al collectively agreed to go the longer route. That was a mistake by way of distance, stress, and time but was made up for by laughter at the situation and unforgettable experiences. I don’t know when the last time was that I had so many good long laughs! We had beautiful views along the trail. We descended down the mountain and back into forest with the river flowing by. This time, we were traveling downstream, rather than upstream. As the path followed along the river, we were greeted with small waterfalls and the constant rush of water flowing over the stones in the river. Unfortunately, we aren’t totally done with the mountains yet. We should have guessed it with our view from the top of O’Cebreiro, but we weren’t thinking clearly on that when we decided on the longer route. We continued along the path climbing then descending and then repeating the pattern. We came across a small village that had us all laughing hysterically. Someone in the town had a serious obsession with the pilgrims not pooping or littering in the woods. There were signs posted everywhere, including about 10 feet off the ground in a tree. Just about every corner you would turn, there was another sigh. It definitely had us laughing! Our feet were tired, muscles ached, and our spirits were dropping. At close to 5:00pm, we finally reached an Albergue and settled in for the night. We ended up walking over 19 miles of rough terrain, and still have a few more miles before we reach our intended destination for today. There was no way that we could have gone on much further. 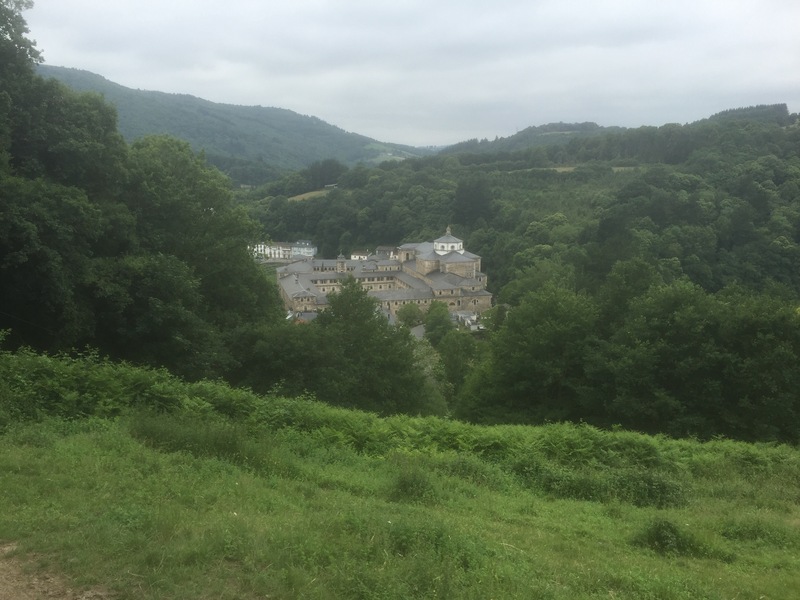 This village that we are staying in doesn’t have much for pilgrims other than the Albergue and a single restaurant. We ate dinner and had several great laughs there over dinner, and then many more upon our return to the Albergue. Sometimes when you are in a crappy situation, you can still try to find something to laugh about. There are times when it is difficult, I know. Even though it was a really hard day, it is probably going to be one of the days that I look back on with the most happy, and hearty laughter.